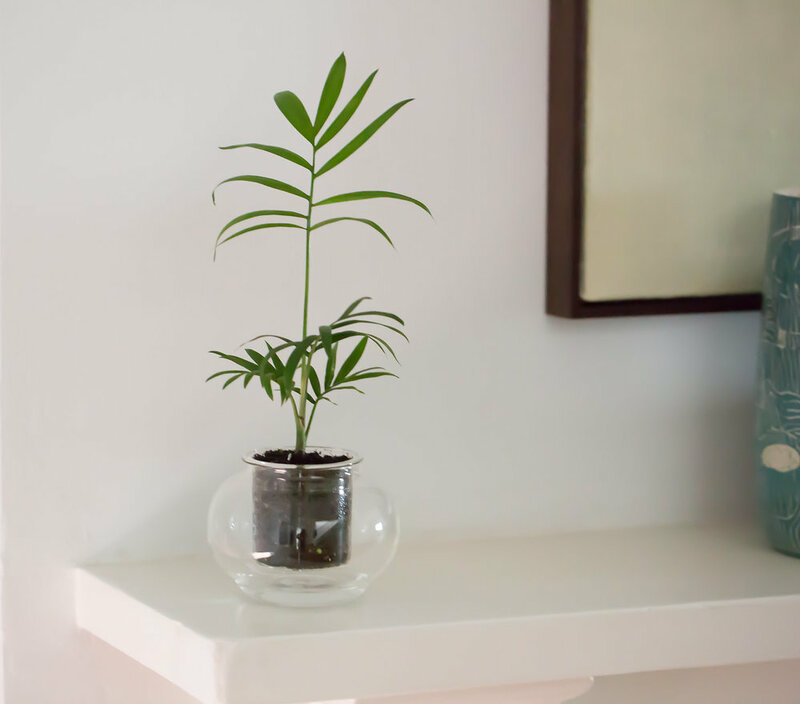 The Parlour Palm thrives in indoor environments where other species may struggle. It tolerates low light and humidity levels, and was proven as an effective plant for filtering various pollutants out of the air. Watering: fill the outer pot with approximately 2 cm of water and refill when the water runs out. Don't worry if you forget to refill for a few days away as the plant enjoys a wet-dry cycle. In fact, Palms like a moist soil but not soggy, so waiting a few days before refilling is recommended. What to look out for: After a while, the plant may outgrow the pot by growing new fronds next the the existing ones. This may indicate that the plant needs to be re-potted. Re-potting: Parlour Palms grow slowly and will not need to be repotted for a while. If roots start to peek through the bottom hole it may be a sign the re-potting is in order. Buy a new pot from your nearest retailer or order a pot here (consider a larger vessel to give the plant room to grow). Insert the wick into the new pot and fill a third of the insert with well-drained soil. Extract the overgrown plant with the soil and use your fingers to split the main plant into several small bunches.Rinse the old insert and position the new plant in the centre. Brown tips: There are several reasons why the tips of the fronds turning brown. They may be the result of too much fertiliser or not enough moisture. It may also relate to the plant’s position. Make sure you position your plant in a warm place with lots of natural light, but not exposed to direct sunlight. Spray your Palm occasionally with demineralised water. From time to time fronds will dry naturally and can be cut from the bottom using a pair of scissors. Scale insects – Most species of scale develop a waxy covering on the fronds. Look out for withered and yellowing leaves or honeydew residue which means that the plant may also be exposed to a mouldy fungus. Physically removing the scale is the easiest way to control a limited infestation. Insecticidal sprays may be effective if the infestation persists but trying to catch the insects early is key to quick recovery. Use a pair of scissors to cut a diseased frond, but only if there are more than 3 fronds on the plant.